March 13, 2001 The winds of March showed up and ripped the Cherokee facility’s doors right off! Took quite a bit of plastic away, as well. That’s the downside of being perched right on the water, as any homeowner will tell you – the mosquitoes are kept at bay, but it often feels like you’re living out the scene in Dr. Zivago when they’re trudging across the windswept plains. 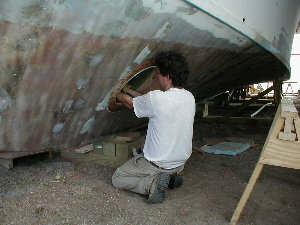 Undaunted, the crew has patched things up, and continues the restoration. 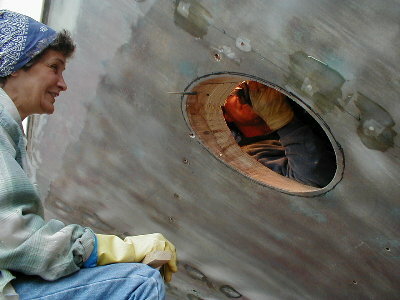 John, Jeanette, and Bill Brown have made much progress with the bow thruster installation. John is sculpting the faring areas so water will flow over the hole in the appropriate manner. 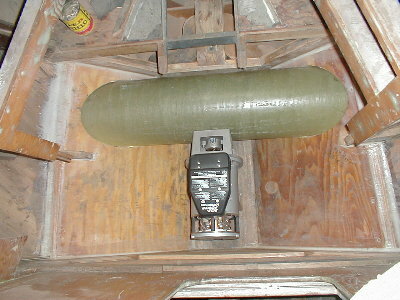 He also fabricated the motor stand, and mounted the motor and gear box in the tube. 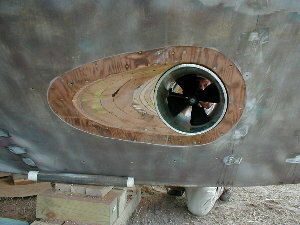 The bow thruster itself is made of GRP, or glass-reinforced plastic. 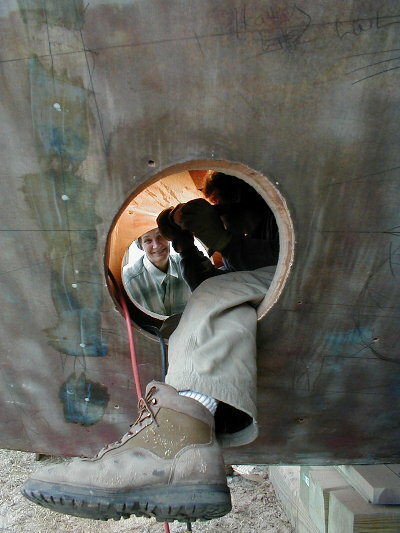 The crew cut the thruster tube and are now in the process of fitting it. 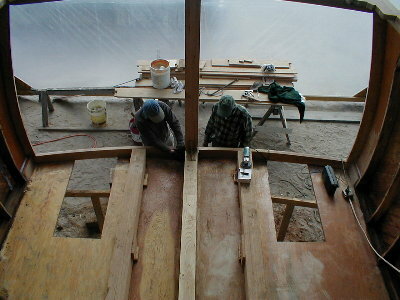 Leonard and crew have continued work on Cherokee’s stern. They’ve scarfed and glued transom frames and sister pieces. The engine room looks clean and clear, since the staging, scaffolding, and Spanish Windlass were disassembled. 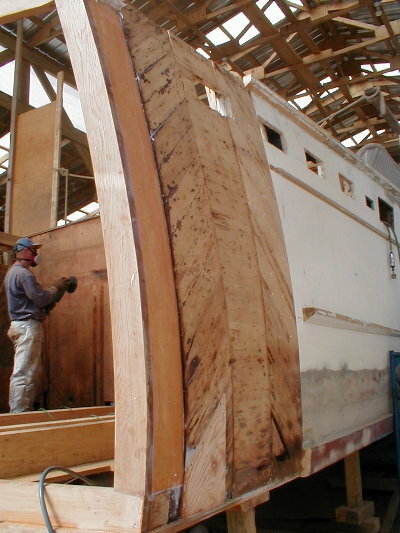 The picture below not only shows Leonard grinding away in the engine room, but also the three original layers of plywood making up the hull along with the recently constructed backing board. Bill Brown is busy working on the vessel’s plumbing and waste system. He is also working on the anti-vibration mounts of the engines. 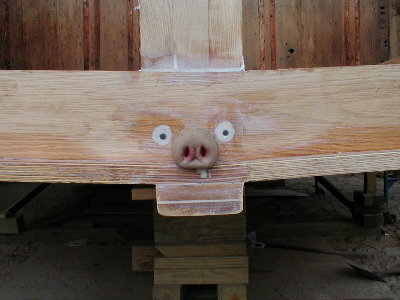 He was amazed to find a face appear on the transom framing (as seen below). Believing he was seeing things due to post-Mardi Gras stress syndrome, he simply ignored it and went back to his plumbing engineering.